When I was in 4th Grade, my classmates and I was given a gold star to write the name of a veteran relative. As a second-generation Chinese-Taiwanese American, it was clear I had no relatives that served in the U.S. military. However, my father mentioned my great-grandfather fought in World War II, and said I should write that down. In our social studies lessons, most of the attention focuses on the Holocaust and the famous battles in Europe, North Africa, and the Pacific, but none on the Second-Sino Japanese War. When my father quizzed me to prepare for tests, he would tell me side stories of my great-grandfather fighting both the Japanese and Communists in Republican China and how our family ended up in Taiwan. These stories stuck with me, and it shaped how I viewed my Taiwanese-American identity. The story didn't end there. After the Japanese surrendered, civil war resumed. In 1948, his unit was decimated by Communist forces and was placed under house arrest. Luckily, his sister had communist connections and negotiated his release. He immediately fled to Taiwan (via Hong Kong) to rejoin his family, became a university professor, and retired to a life of pleasure. Sadly, he suffered from PTSD and died in 1976. The stories of my great-grandfather fighting in China, as well as my grandfather's career as a Taiwanese diplomat, became a significant influence on my interest in politics. 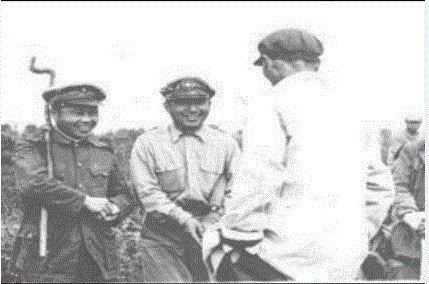 While studying abroad in Beijing, I found a rare photo of my great-grandfather in Burma, smiling with some of his soldiers. He has become someone that I admire but will never have the chance to meet.